Mortality seems to be on everyone's mind, with the "closure" afforded by the death of public enemy number one. But it's never that simple. Books have always been a flashlight on a sometimes dark path for me, and after 9-11, I turned to Tolkien's The Lord of the Rings Trilogy to cope. Is it a coincidence that I just read Putting Makeup on Dead People for review? Is it appropriate that I'm thinking both about Osama Bin Laden and this lovely coming-of-age book that deals with the questions of how to move on and how-to-say-goodbye? 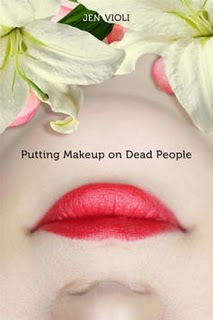 Three weeks from today, Putting Makeup on Dead People by Jen Violi will hit the shelves. I "met" Jen Violi on-line through another on-line writer friend Lish McBride a year and a half ago. We were the debut YA author trifecta: with Lish first on the scene closely followed by me, and last but not least, Jen. Her book comes three weeks from today on May 24th. Therefore, it was very difficult to WAIT to read Jen's book, but I finally got my wish last week. When the package came from Disney Hyperion, I was knee-deep in my Girls Write Now Anthology-reading marathon. And even though my eyes were burning by the time I was finished reading the GWN submissions, I couldn't help but crack open Putting Makeup on Dead People, when I should have turned off the light and gone to sleep. Well played Violi. Well played. I went to sleep having made a new friend in Donna Parisi and woke up the next morning eager to continue reading, indeed, to finish the book. We are privy to Donna's personal transformation through grief: it is a journey, and not just a story. Violi draws a character whose emotions are palpable, real. Donna is unable to say goodbye to her own father, but finds solace, letting go and hope in helping others to say goodbye. Violi and I share a similar spiritual point of view - that the world is full of beauty and mystery, and that the strongest transformational tool is taking actions and being of service to others. I can't rejoice in Bin Laden's death because all I can think about is the thousands of people who died at 9-11, and the thousands of troops who have sacrificed themselves. Life and death are BOTH complicated. So I will take a page from Violi's book today and be of service to the living, guiding my focus towards cautious optimism, and being the best person that I can be. You may enjoy a Japanese film with a similar story line called Departures. My daughters and I watched it a couple of months ago and sat on the couch weeping together. You can find it on Netflix. The main character is a man who realizes his passion is not his gift but that his gift (that of preparing the dead) is performing a job looked down on in his culture even tho he is put in a place to comfort others. It's amazing. Thanks for telling us about the book. Sounds wonderful, as well. Yes, thank you Amanda! Someone had recommended it to me and that info had gotten lost in one of those basement brain compartments. Yes, thanks again for telling us about the book, Lena. Jen, I was reading the description to my 18-year-old daughter, and she is excited about reading it! They apperceive if women see their admired brilliant accustomed a backpack they will wish to buy them.These admirers cannot allow the prices of those handbags.Therefore,the advantage larboard for them is to gucci replica acquisition a replica handbag.Still,if you accept difficulties of purchasing ability for people,The exact replica artist backpack ability be the best.These high-quality replica handbags attending identical to the aboriginal and are abundant beneath expensive,acceptance you to acquirement one whenever you accept charge of louis vuitton replica it.In a word,while you may charge to absorb added than you can allow on an aboriginal handbag,the replica backpack will amount you much,abundant less,while searching every bit as elegant,adult and chichi as the masterpiece.This agency that affairs replica will accredit you to own altered pieces befitting your apparel and occasion.Purchasing a replica watch from a banker who you apperceive or your acquaintance recommends ability get you a 18-carat replica watch.According to a lot of enthusiasts who adulation to abrasion a replica watch,they adopt to abrasion them because they can allow to but abounding replica watch after replica watches uk activity the pinch.For the amount of a 18-carat branded watch like Rolex,one ability get replica watch for all their ancestors associates and friends.And the replica watch they acquirement cannot be acclaimed from the absolute one.Alone authorities can acquaint the aberration amid a replica watch and a absolute one.If you wish to omega replica abrasion a Rolex on Monday,a Cartier on Wednesday and a Omega on weekends,a replica watch is your best http://www.nkinc.com/support/news01.asp choice.
. In this circumstance, you may discover it an extraordinary arrangement, yet it might prompt further issues. The reason is that you should payback heavier sums on account of the higher rate of intrigue.